For many years, the words Alabama Football evoked memories of black-and-white gridiron classics and ‘Bear’ Bryant’s hound’s-tooth hat. For Crimson Tide Productions, the creative-media arm of the Alabama Athletics Department, that has changed. With five championships in the past nine years (including last night’s dramatic win over Georgia in the 2018 CFP National Championship Game), the visual history of Alabama Football is no longer sepia-toned; it’s bright, colorful, and in high definition. The 2017-18 football campaign marked a dramatic change in the image that Crimson Tide Productions presents across social-media platforms like Twitter, Instagram, Facebook, and Snapchat. A concerted effort was made to shift the story away from the program’s tradition and toward the future to appeal to potential recruits. The shift has led to a much more youthful, all-access approach to bringing fans inside the life of an Alabama student-athlete. According to Justin Brant, director, Crimson Tide Productions, the crew shot content in Atlanta and at Mercedes-Benz Stadium using a new high-powered RED camera and a Sony FS7 to capture slow-motion footage and a collection of smaller units: some Sony a7S II units, a Sony FS700, and a 360-degree camera (which the team was ultimately limited in its ability to use, given the various rights and security issues surrounding the presence of President Donald Trump last night). Besides Brant and King, the video team working onsite in Atlanta comprised Chris Liskiewicz on graphics and social-media posting, Adam White designing motion graphics, Michaiah Smith and Alex Seiver shooting video, and Christopher England lending a hand on video while focusing on working Snapchat. 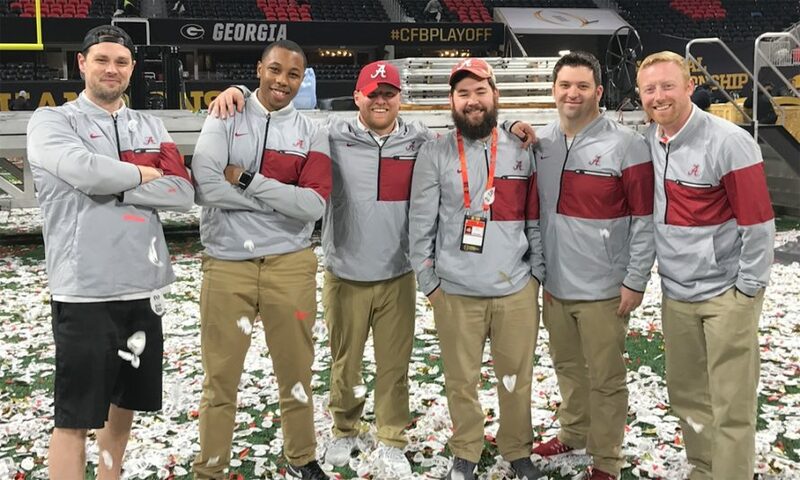 Crimson Tide Productions has had the opportunity to cover six college-football championship games (in both the BCS and the CFP eras) so they have learned a lot from planning and executing content for big-ticket events. If there’s one thing the team has learned throughout that experience, it’s to never lose focus on why they were there. King concurs, though acknowledging that covering an event like this for an athletic department can be overwhelming. He advised his colleagues to remain focused and do what they do best.